NHS Primary Care in England faces what at times looks to be insurmountable challenges. The application of automation is seen as a boon to address and alleviate some of these challenges. To understand the role of automation the project at hand employs a work practice task based approach to understand the work of tools, technologies, and people in primary care. The empirical cases presented in this paper concern a specific type of data work that occurs in primary care: clinical documentation. The technical feasibility of automating this data work is discussed in the context of natural language processing. Next, I discuss the clinical documentation practices of General Practitioners (GP) and Practice Nurses (PN) at two primary care health centre sites. The data work of each clinical role has similar demands between GPs and PNs. 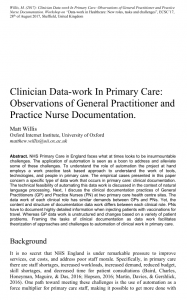 Yet, the content and structure of documentation data work differs between each clinical role. PNs have to document highly detailed information when injecting patients with vaccinations for travel. Whereas GP data work is unstructured and changes based on a variety of patient problems. 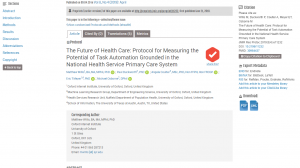 Framing the tasks of clinical documentation as data work facilitates theorization of approaches and challenges to automation of clinical work in primary care.